Why Does the Home Crowd Boo Intentional Walks? Over the last 10 seasons, home-team batters were intentionally walked 5,813 times. We saw 478 of those in 2016. If you watch enough baseball, you’ve seen several of these on television or in person. In many cases, these walks are met with enthusiastic booing by the home crowd, which is always something I’ve found particularly curious given that being offered a free base is almost always a good thing. Of course, intentional walks aren’t as valuable as doubles or home runs — and, on average, they occur at times when they’re significantly less valuable than singles. In most cases, however, an intentional walk is better than the expected value of a normal plate appearance. This is why we’ve seen a movement away from intentional walks over the last several years; it’s rarely advantageous for the pitcher. 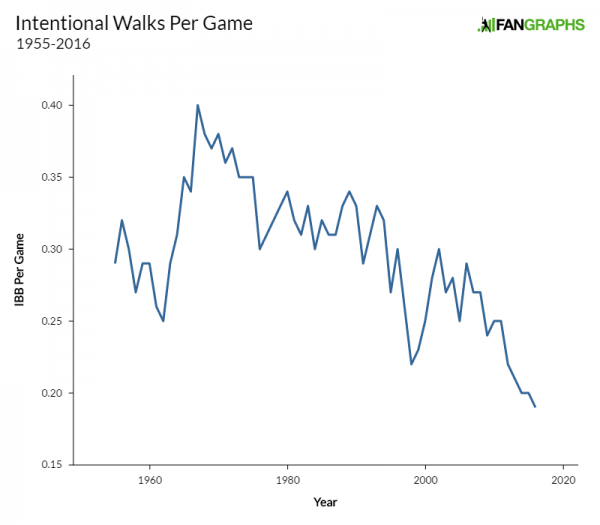 Given that the evidence seems quite clear that most intentional walks benefit the hitting team, why do fans frequently give the pitcher such a hard time? I see three possible lines of reasoning. There’s a genre of baseball discussion known as the “fun fact.” You might also call it “trivia.” A player is the first to accomplish a particular feat in 40 years; another is the only one to reach a notable career mark in a particular season. The genre doesn’t demand rigorous analysis; it’s merely a collection of interesting tidbits which may or may not be relevant in more thorough discussions. Some fun facts are amazing and others are forced to the point of farce. There’s another genre of baseball discussion we’ll call “can he keep doing this thing?” analysis. This is very familiar to the loyal FanGraphs reader. We do this kind of thing all the time. We notice a player trying something new and try to determine if it’s meaningful. This article will subject Cesar Hernandez’s 2016 season to both sorts of discussion. It’s not uncommon for ballplayers and managers and other people associated with baseball to evoke the “unwritten rules” of the game. For some, these unwritten rules seem absurd, a sort of arcane code that frequently contradicts reason. In essence, though, these “unwritten rules” amount to what a social scientist might refer to as “norms.” And, discussed in these terms, they make a little more sense. Using the term “norms” instead of “unwritten rules” removes some of the connotations of the latter term, and let’s us think about the game without choosing sides. One norm that’s rarely scrutinized is the existence of distinct positions. The pitcher and catcher are highly regulated by the official rules, of course; otherwise, though, the league doesn’t have a lot to say about what the positions should be and how the men filling them should operate. For that reason, some positions are fluid. Corner outfielders are largely interchangeable. Middle infielders have generally the same jobs. Most of what makes the positions different are the existing norms about how they should be played and what you need to do to succeed there. But as I noted a moment ago, there are exceptions. Catchers have a very different job from everyone else and that job is typically understood to be more important and more demanding than the other positions. It’s harder to be a catcher than it is to be an outfielder, but the positions also require dramatically different sets of skills to the point at which you can’t really compare the two in a meaningful way. That doesn’t mean we can’t try. On occasion, catchers are asked to play positions other than catcher despite the required skills being quite different. How do those catchers do when they move from behind the plate? Does it tell us anything meaningful? Last winter, I performed an exercise to determine the performance of catchers at other positions. This represents an update of that piece, for the 2016 season. You have a choice. Either I give you $100 right now, or you can let me flip a coin. If the coin lands on heads, I’ll give you $250. But if it lands on tails, I’ll give you $20. I’m using a fair coin, so the expected value of flipping the coin is $135 based on the 50/50 odds it lands on heads or tails. If you like risk or are a risk-neutral person, it’s an easy decision to take your chances with the coin because the odds are strongly in your favor. If you’re a risk-averse person, however, you’re more likely to take the sure thing because $135 isn’t a whole lot more than $100, and $100 is a whole lot more than $20. Let’s add another wrinkle. It’s the same choice, but if you choose the coin flip, you have to wait a month. The dollar amounts are the same, but now there’s a time component. To get the value of the coin flip, you need to apply a discount factor to the $135. For some people, that discount factor is pretty close to one, but it might be much lower if you’re strapped for cash and the $100 would dramatically improve your life in the present. Major-league players face a much higher stakes version of this decision when their club comes to them with a contract extension. Do they take a sure thing now, or do they wait and gamble on themselves? While we’re focusing a lot on the 2016-2017 free-agent class this month, there are 13 players who could have been free agents for the first time this year but instead chose to cash out early by signing extensions. Did they make the right decision? Neil Weinberg: Nick Stellini and I are going to be your hosts this evening. Nick is going to be joining the site as a regular writer in a week or two, but this is his soft launch. Korey Cluber: FOX had Carlos Santana listed as a 1B/OF in the pregame. Nick Stellini: If I blow up on the launchpad it’s all Neil’s fault. Neil Weinberg: I saw this. Loved it. I am all about players playing weird positions. Who would you like to win tonight? As you’ve likely heard, the first World Series game at Wrigley Field in seven decades will be played this evening. The starting assignment belongs to Kyle Hendricks, the soft-tossing right-hander lovingly known as “The Professor.” At this point, Hendricks has done enough to convince the attentive fan that he’s an above-average major-league pitcher. While many of us were on board with Hendricks in 2014 and 2015, there might have still been cause to doubt a pitcher whose fastball sits at 88 mph. After a 2016 season during which he both maintained his strong fielding-independent numbers and allowed very few runs, there isn’t much room left for doubt. Hendricks has further cemented that impression on the biggest stage, allowing just three runs in 16.1 innings this postseason to go along with his consistently strong fielding-independent resume. Even if you give plenty of credit to the Cubs’ superb defense for Hendricks’ top-line numbers, it’s hard to ignore his performance this season and over the last few weeks. This postseason has featured plenty of interesting baseball with all sorts of compelling performances. Without diminishing Javy Baez’s tags or Clayton Kershaw’s brilliance, it’s probably fair to say that the two main storylines have concerned bullpen usage and the impact of replay. Perhaps we’ve reached a bullpen tipping point, but it seems almost certain that this postseason will lead the league to revise exactly how replay is applied to split-second base detachments. While most people have latched onto these stories, I’ve had my eye on something different. The Cubs and Dodgers both carried three catchers for at least one series and have both used three catchers in a single game during these playoffs. Admittedly, this is a less important and obvious development than bullpen changes and replay controversies, but it sets up a discussion I’ve been wanting to have about a potential rule change. The Orioles lost Tuesday night without using Zach Britton, one of the game’s best relief pitchers. It was a do-or-die game that went to extra innings, but Buck Showalter held his closer for a save situation because the closer is the closer. While there’s some argument for maintaining bullpen roles and hierarchies over the course of a 162-game season, sticking to that kind of mentality in a single-elimination game defies comprehension. If there were ever a time to use your closer early, it’s when a single run could end your season. Showalter didn’t and he’s watching the ALDS from home rather than a dugout. On Thursday, Terry Francona took a different approach. In Game One against Boston, Francona went to Andrew Miller, his own relief ace, with two outs in the fifth inning. His club led 4-3 with Brock Holt, Boston’s No. 2 hitter, coming to the plate. Francona made the decision that Trevor Bauer was done and it was time to go to the pen. Francona called on Miller for six outs, followed by Bryan Shaw for two and Cody Allen for five. While fans of 20 teams were coping with the end of the season over the weekend, Dennis Lin delivered some incredibly exciting news. Padres manager Andy Green and host of other Padres officials were in Peoria to watch Christian Bethancourt throw a bullpen session. An injured player throwing an October bullpen session wouldn’t normally draw the manager, pitching coach, bullpen coach, minor-league pitching coordinator, and player-development coordinator, but this was no ordinary rehab session. “We’re flirting with the idea of this guy being a very intriguing ’25th man’ who can catch, can play the outfield and can pitch,” Green said. “I know no team has actually really tried to deploy a guy in that capacity — probably ever when you consider those three dynamics. That’s right: the Padres are exploring the idea of making Bethancourt a catcher, outfielder, and pitcher hybrid. Even if you didn’t predict great things for the Diamondbacks this year, it’s hard not to be disappointed by their 2016 season. You can set aside their various front-office nonsense and still come to that conclusion. Zack Greinke hasn’t been great, A.J. Pollock missed significant time, and Shelby Miller’s year has gone about as poorly as you could imagine. The club is set to lose nearly 100 games and finish last in the NL West. You’d think that Jake Lamb offensive exploits would be among the club’s few points of pride this season. In 2015, Lamb recorded a 91 wRC+; he’s raised that figure to 115 this year. But it’s more likely that the club is worried about their young third baseman going into the season’s final games. After a scorching hot start, Lamb hasn’t just cooled off in the second half, he’s cratered.